Are you on the look out for Amazing Princess Cake Ideas for your Princess Themed Birthday Party? 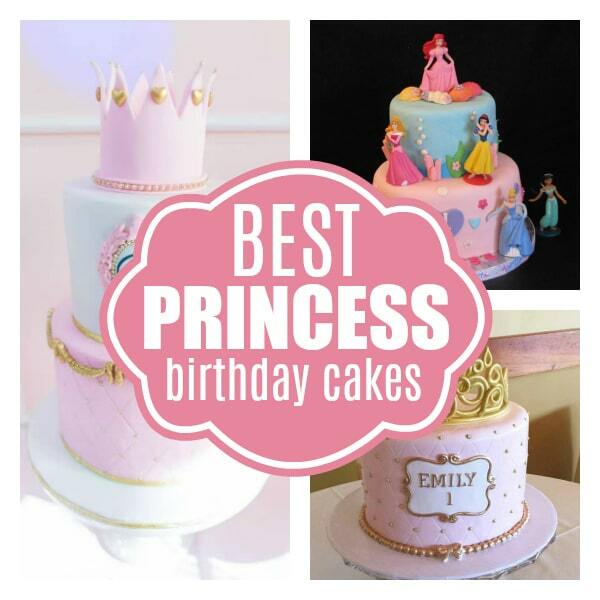 Look no further than these pretty princess birthday cakes! Take a peek at these gorgeous Princess Cake Ideas for your little girl’s big birthday celebration! Wow! If your little one has her heart set on a Princess Birthday, these fantastic cakes are going to give you the inspiration that you need. You can’t go wrong with any of these! Many little girls catch the princess bug when they are young and suddenly want some sort of princess themed birthday event. 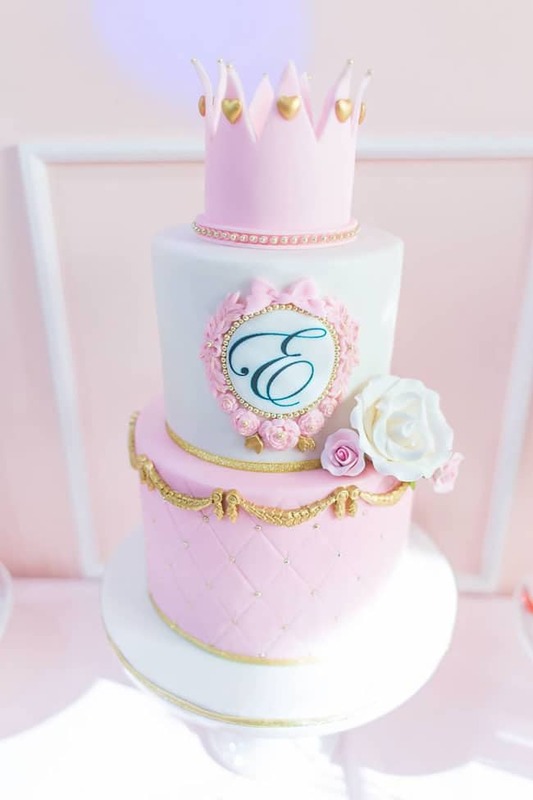 Whether it’s a Disney party, a royal themed birthday, or they simply want everything to be pretty in pink, you are going to find gorgeous Princess Cake Ideas for any type of princess theme! Even better, if you are a parent who likes a good DIY challenge, some of these Princess Cake Ideas are perfect for a DIY princess cake. We totally got your back! 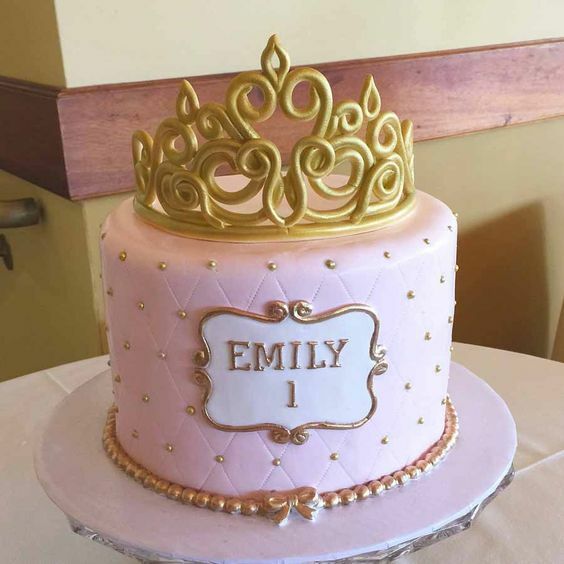 Princess Cake Idea #1: This Exquisite Princess Birthday Cake is picture perfect from the tip of the crown on top, to the bottom of the cake stand on the bottom. Your birthday princess will feel every little bit the royal star of her day with this beautiful royal princess cake! Personalize your cake with your birthday girl’s initial in the middle, along with gorgeous white and pink frosting flowers. This princess cake will be sure to be the show-stopper at your Princess Birthday! Princess Cake Idea #2: A perfect Princess Castle Cake is just what the doctor ordered for this special Princess Theme Cake! 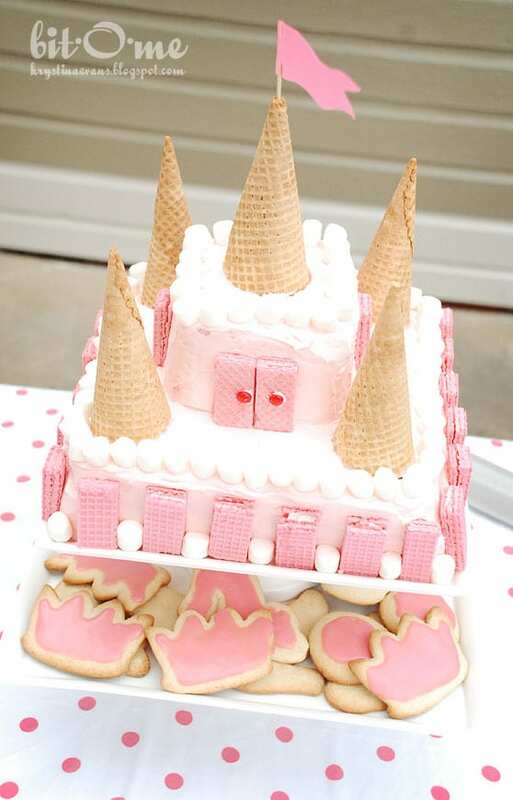 We love how the castle comes to life with upside down ice cream cones, along with fun cookies and wafers helping to decorate the castle walls. This is a great DIY princess cake that is totally doable with absolute excitement for your beautiful princess! Princess Cake Idea #3: What is a Princess Cake without a crown?! 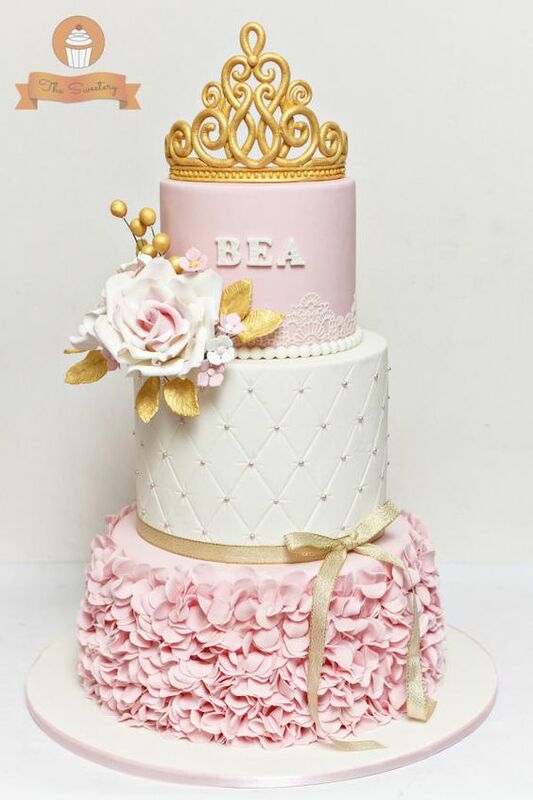 This pink and gold Princess Birthday Cake is the complete mix of understated, yet elegant. 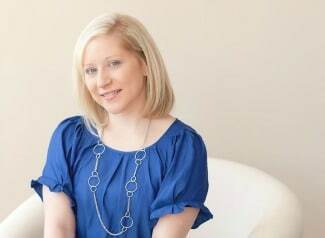 We love the simplicity of having one layer, but with the fun gold accents that shows off all of the great princess qualities. 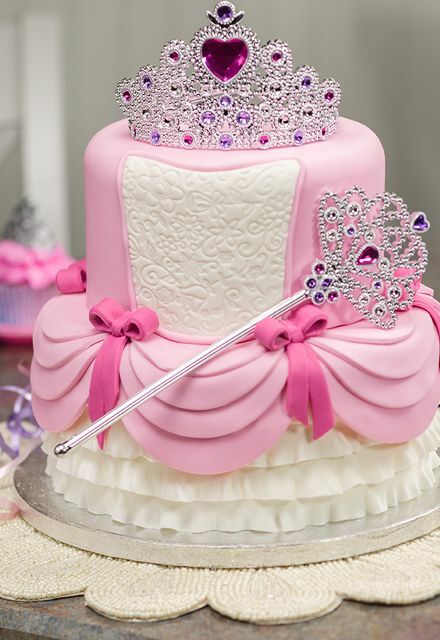 Any royal birthday party theme will be even better with this great princess birthday cake! 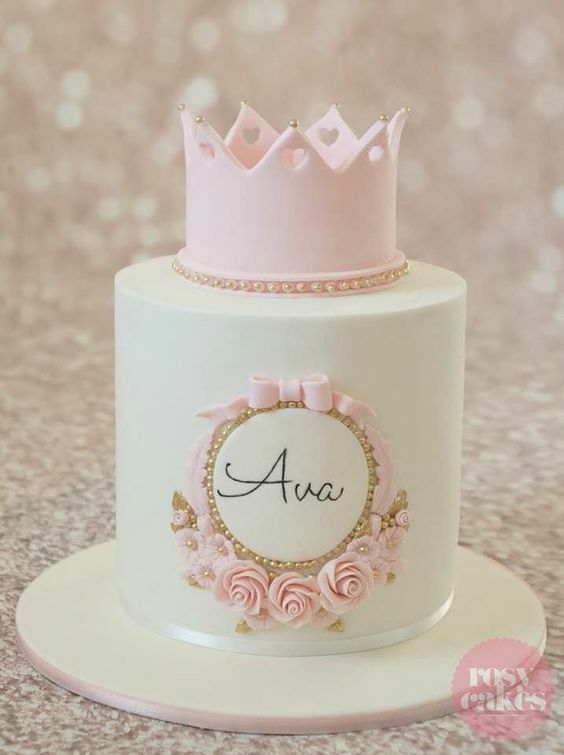 Princess Cake Idea #4: This ultimate, feminine, girly girl Pink Princess Birthday Cake will have everyone wanting to plan their own Princess Birthday next! Who wouldn’t love this amazing Princess Birthday Cake, with a beautiful crown, gorgeous pink icing bows and perfect colors all around! This is an ultimate royal princess cake that any girl would absolutely love to have! 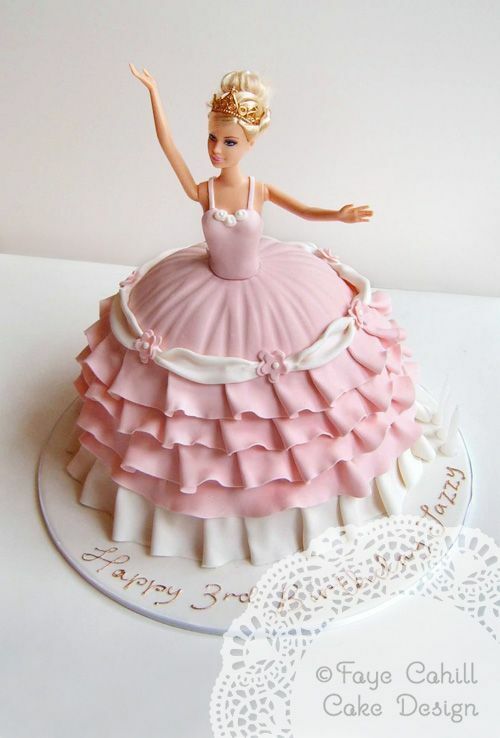 Princess Cake Idea #5: Who says your Princess Birthday has to include a Princess cake? 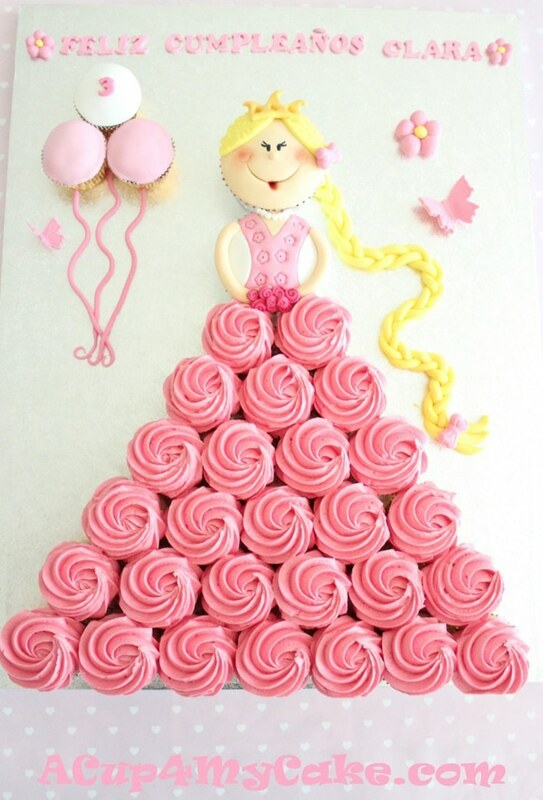 Check out this sweet Princess Cupcake Cake, that creates the perfect princess dress! What a unique Princess Cake Idea that is a perfect change of pace for a little girl birthday cake. And if you want to, you can even make your little princess cupcake girl look just like your sweet birthday girl! Yay! 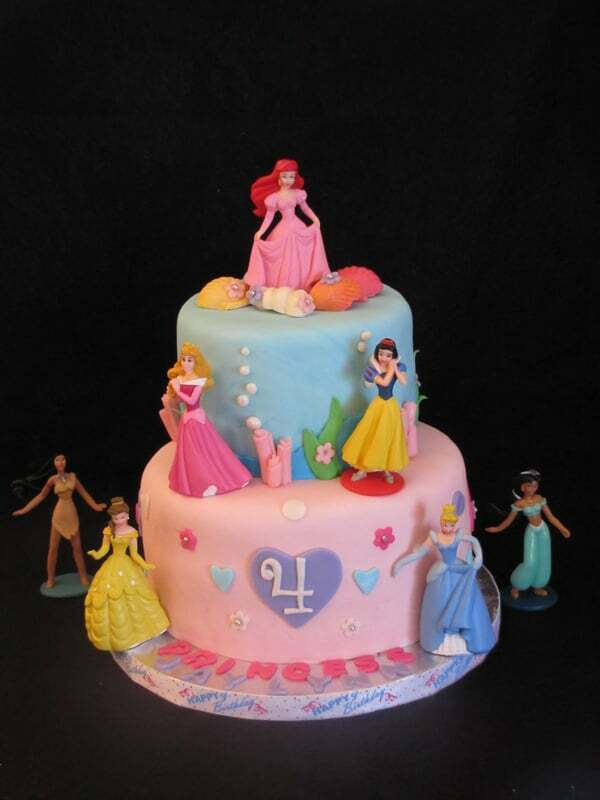 Princess Cake Idea #6: Who doesn’t love a good, old fashioned Disney Princess Cake?! We love this cake because you can use Disney princess figurines to help decorate the cake, which is much easier than creating them from fondant! And even better? The birthday girl can keep all of the figurines after the party for part of her birthday present! She’ll love that! Princess Cake Idea #7: Another Illuminated Princess Birthday Cake that has a Disney twist is this gorgeous Princess Theme Cake! Look at all of the gorgeous details around Princess Ariel, along with many little girls’ favorite princesses! But the best detail of this royal princess cake is that the top lights up! It is almost too good to be true! Princess Cake Idea #8: What a spectacular Pink and Gold Princess Cake! This gigantic flower that is a centerpiece of this sweet pink princess cake is a beautiful accessory on this cake. We also love the giant gold crown that seems to sweep all the way to the top of the heavens! What an extraordinary cake with perfect decor on each and every layer! 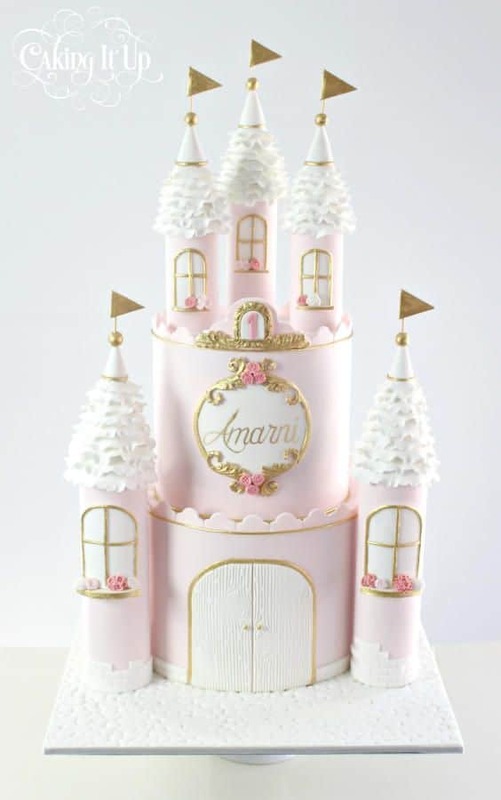 Princess Cake Idea #9: The ultimate Princess Castle Cake can be found with this amazing Princess Theme Cake! From the door on the bottom to the incredible spires all around the top of the cake, this truly feels like a princess’ dream come true! This might be one of the best princess birthday cake ideas that we’ve ever seen that is absolutely incredible. 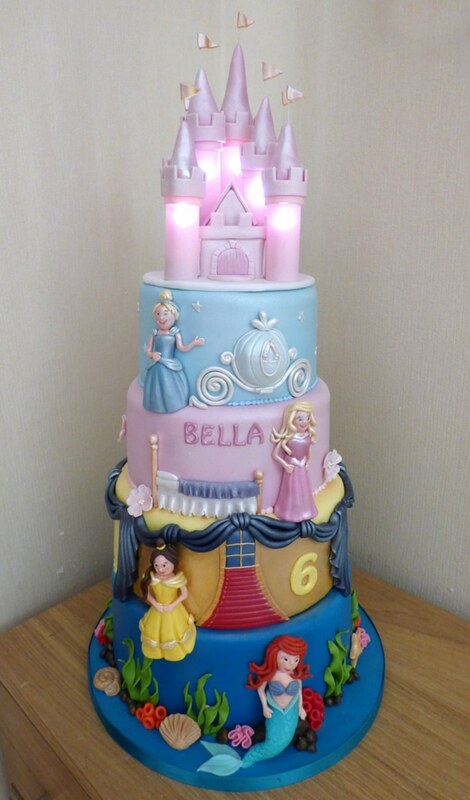 This is a dream cake for any little princess! 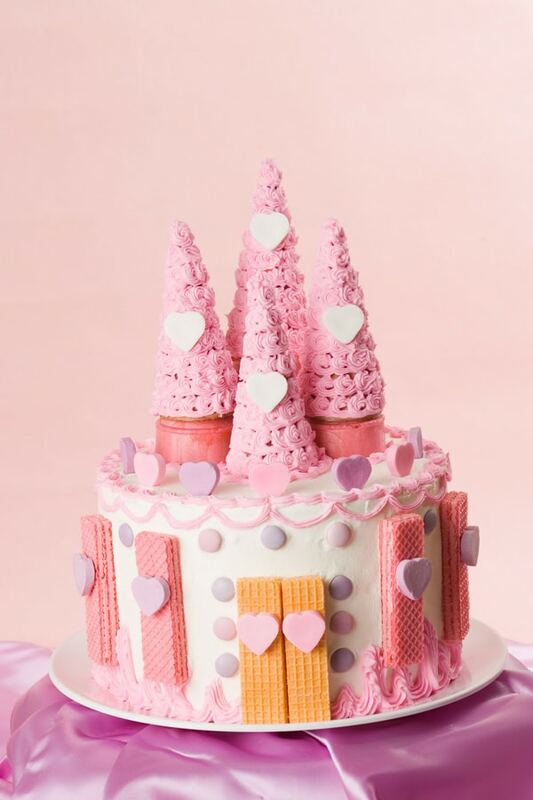 Princess Cake Idea #10: This Princess Castle Cake is the ultimate unique royal theme cake that we’ve seen! This would also be a great cake to use for a Valentine’s Day bash, as well! We love all of the sweet hearts that are found on the cake, with yummy wafer cookies used as decorations on the layers of this sweet cake, as well! And how can you have the perfect castle cake without some great castle top spires on top of the cake? What a great idea to cover the ice cream cones with spiral frosting decor, too. We love it! Princess Cake Idea #11: The ultimate Barbie Princess Cake is a must-have when you’re talking about creating a Princess Theme Cake. It’s also a great DIY cake that everyone has to try once in a lifetime! Your little Barbie loving princess will be admiring this cake and sad to break it apart for her party, but you know it’s going to taste amazing! Princess Cake Idea #12: This simple Princess Cake is a great way to keep everything understated, yet gorgeous. The pretty pink crown on top is a simple one, but this princess cake is so sweet, pretty and girly. 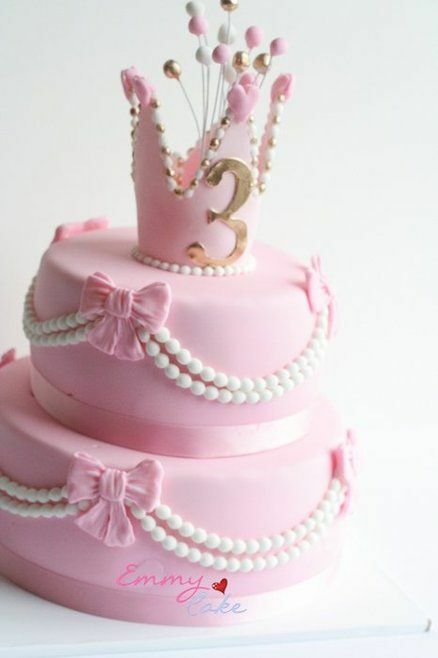 What a great princess cake idea! Princess Cake Idea #13: This Purple and Pink Princess Cake feels like your little birthday girl’s fairy godmother is watching out for her with the gorgeous crown and wand! What gorgeous cake work with the feel of a princess gown flowing all around the cake stand. It makes you think of a real princess being the center of attention at the birthday party! Which of these princess cake ideas are your favorites? Let us know in the comments below!